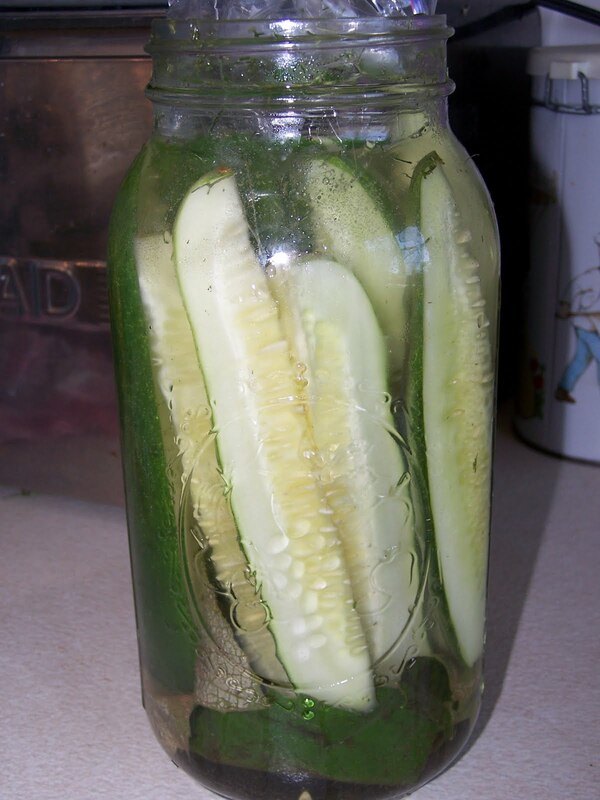 FarmgirlCyn: I'm in a pickle! Had some rain this week and before I knew it, the pickles had turned into overweight cucumbers! That's OK, cause I cut the big ones into spears and pickled them anyway! kinda how your great-grandma might have fixed them. I, once again, followed Michelle's lead, and will send you directly over to her blog for the recipe I followed. I DID add grape leaves to the bottom of my jars as they are supposed to help keep the pickles firm. My "average" sized pickle batch, sitting in a food grade plastic bucket. These will set on the counter (weighed down with a ziploc filled with water and covered with a linen dishcloth) for anywhere from 1-4 weeks, being checked every day by me, to skim off any foam or impurities that come to the surface. I will keep a closer eye on these, as the spears will likely be pickled before the whole ones are done fermenting. They also have more of a tendency to get soft quicker, so we will definitely be eating these first. Now I just have to make room in that basement fridge for all the goodies I am coming up with! LOTS going on in the kitchen this week as produce from the CSA picks up and our at-home garden begins to flourish! Am also teaching a "Spices/Herbs 101" class next Saturday at the CSA farm, so it will be a busy week indeed! Keep in touch as we ALL enter this busy season of putting by and freezing or fermenting our blessings from the Lord. You're all well ahead of us over there on the west side of the state! 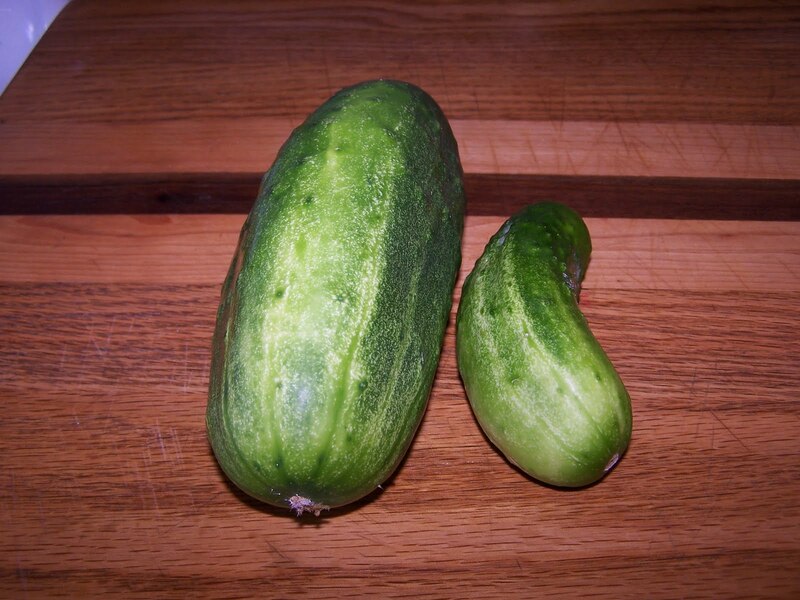 We have picked two tiny pickles! I love homemade pickles...yum! You are way ahead of me too, and we live close to each other! But I got my cukes planted late. And yes, I think you should tape your class too! 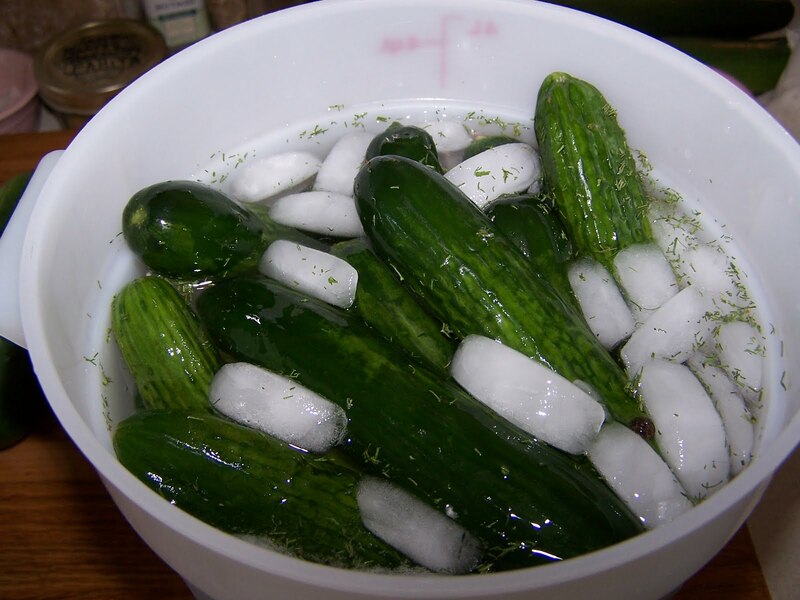 Your pickles are ahead of mine just have some babies right now. I agree you should tape your class. I may try making some fermented vegetables, tried make sauerkraut last year it didn't work. So I'm a little leery to try again. Beautiful!!!!!! I have tiny ones coming on. My first batch got to much rain on them. Can't wait!!!! Oh what yummy goodness! Wish I could taste test those for you,lol! All of our cukes are done here for the most part,it is blazing hot. ... and blessings back to you Cindy! used to get cuckes from fulton street market ... had the best dill pickle recipe ever...lost it! wish I HAD a second fridge!! Funny Cindy ~ as you already know today was making pickles day in my house too!! I also made bread and butter pickles, and I think they are gonna be super yummy!! I think I have 10 quarts to put up - and hope to make a few more here and there before the summer is out. Would be nice to have some pickles through to the New Year!!! Isn't summer so fun!! I think it would be really neat if you would video tape your class. I am a person who doesn't like pickles, but those look amazing! Great job girly! I can appreciate how fast a garden can get away from you! LOL. Happy pickling! Way to go! Yes, this time of year is almost scary in the garden! one year we had a bumper crop of "cukes" (as my honey's family calls them). every jar that winter brought back so many good memories...and yummy as can be! I hope we get alot of cukes this year! Yours are beautiful..even the overweight ones will be awesome pickles. I just adore dill pickles and hope mine do well enough to can some this year. Last year wasn't as good a year for cukes as some..just enough for salads and stuff. I won't have ripe ones until late August. You asked about my knee..it is doing so much better the last few months. It did ache like yours when I was on my feet too long for the first 8 months or so..hard to beleive that it has been nearly 11 months since my surgery now. Now it just aches if I have to sit in one place for over an hour or something like that. Much better. I plan to wait to get my right one done until I have no choice..it is a long long time to be so "out of it" for me. You are not that much older than me by the way. I will be 52 on Oct. 1. Have a great week!!! Your class sounds like fun!! YOU ARE IN A PICKLE! Loved this. Thanks so much for dropping by. I went back through your old posts and really enjoyed them. Thanks for stopping by my blog posting on Beet Kvass. Give a try I think it will change your mind about. I lacto fermented pickles today - have 4 jars on the counter going. Last year I did 4 or 5, I forget 5 gallon buckets of long brined dill pickles with grape leaves. I see you put the Pea picture I made on your sidebar. Your Welcome!! You make me tear-up. How I miss my little county garden. We had to move into the big city about 10 years ago and I never missed the fresh veggies and canned goodies as I do right now reading your post. I used to "glean" in the tomato fields too and can enough tomato sauce to last all winter. Now I just buy Ragu. Not the same! I do love looking in on your farm. Thanks for sharing the good life and bounty from above!